Tucked away in the streets near the Singapore River and at the foot of the banking district, is a gem that's fast gaining popularity as party central with locals and expatriates. 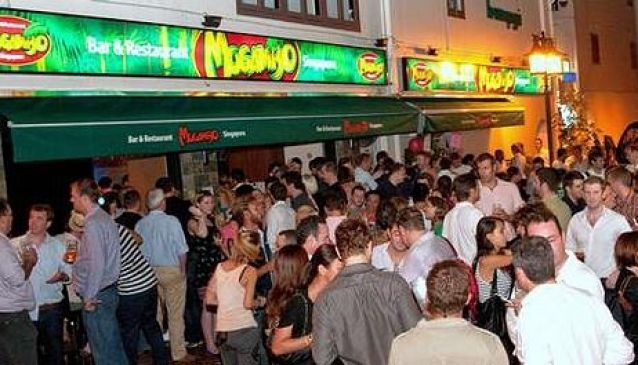 Mogambo features two bars - a cosy island bar that's located indoors, and a second bar that caters to patrons who want to fully experience Singapore's evening climate at the outdoor and drinking area. With one hand clasping your mug of ice cold beer, catch 'live' football, rugby, racing and sports fighting action onscreen and cheer on your favourite teams with your friends. Dig in to an hearty menu by the BERGS gourmet burger company or order some quickbites for those just wanting a nibble.